The Bill Blair Birthday Celebrity Cruise was a huge success! Our adventure began at embarkation on Monday, August 18, and ended on August 22, 2003. We met for a brief Meet & Greet cocktail party, hosted by Bill and Toni Blair, where goodie bags of novelties, boarding gift packages, and membership packages were given out... Along with the commemorative, limited edition photos! There was a Meet and Greet door prize drawing. 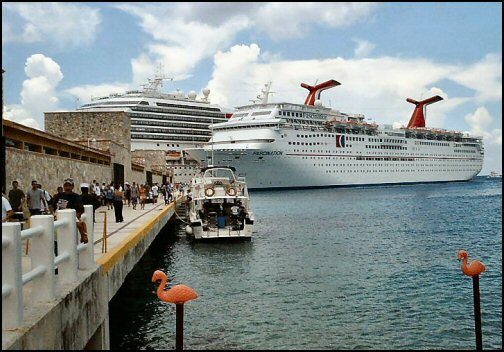 Ports of Call included Key West, Florida, and Cozumel, Mexico. Key West featured Hemingway's former home and the "original" Sloppy Joe's bar (now called "Captain Tony's"), which is the bar Hemingway frequented. Alien Headquarters was home to many games and events, including "Bill Spotting", "Name the Alien Races", and The Make-up Demo, to name just a few. At the make-up demo, Bill was changed (within 2½ hours) into an alien and toured the ship. This "tour" was met with mixed emotions from both crew and passengers alike! The alien even kissed an over-zealous male passenger on the cheek! After the "tour", the Alien was reluctantly transformed back into the actor, Bill Blair before everyone's eyes! Dinners onboard featured a wonderful Conga Line Show by our servers, which Toni Blair and a few others from our group joyfully joined in on. Our departure day, Friday Morning August 22, 2003, was a heart-breaking scene, with crying, hugs, and everything--but we all survived it and arrived on shore a few hours later to say goodbye once again before being carted away by individual cabs and shuttles. I have to thank you both for the cruise. It was probably the best trip I've ever had in my life! It was the best combination of convention and vacation anyone could ask for. There were so many things to do on the ship and visiting Key West and Cozumel just added to the fun. It was lots of fun to do things as a group, and I think we all came away from the trip as good friends. I can't wait until the next trip to see everyone again and start a whole new group of memories. Count me in for the next one! I will definately be there!!! I want to thank you for the cards thanking us for coming on the cruise. Thad and I loved them (Thad really liked the smiley Toni sent him). I just wanted to say Hi and tell you what a great time I had at the convention you had on the crusie ship.......... I am still telling people about it. I think I had one of the best times of my life. Not only did I meet great people at the convention, the events and activities were great also. My friends were amazed when I tell them I would leave my cabin at 7:30 (AM) and not get back until after 1:00(AM) because of all the things there was to do. You and your wife Toni were the most gracious people I have met and the most organized. I have to add that not only did I have the fun of the convention but there was also all the things to do on the ship and to top it off we got to see Key West and Cozumel. I know this might be out of place, but I have to tell you that the price I paid for the event was so reasonable. When I tell people,they want to know how I got to do all that for such a good price. Please let me know when the next cruise is, because I am there. Thank you once again. Made it back to Houston. Had a wonderful trip. Argelia and myself are looking forward to the next cruise. There was so much to do it will take at least 4 cruises to do everything. Thank you so much for having us along.